Description: A bit more upmarket than your typical departure lounge restaurant, this is one of Gordon Ramsay's outposts and serves breakfast, lunch and dinner and has its own bar as well. It even provides 'picnics' - basically a packed lunch that you can take on the plane with you. Reason for visit: Brunch before a long-haul flight - I never particularly like the food you get on planes so thought I would indulge in a decent breakfast. I ate: fishcakes and lime mayonnaise from the express menu, as I wanted something quite light, followed by pineapple carpaccio with passion fruit sorbet. 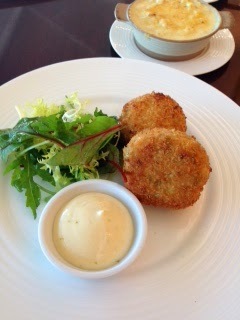 The food was: The fishcakes were excellent and the lime mayonnaise just right. 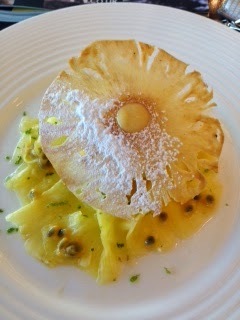 The thin slices of pineapple were refreshing and the way the food is presented is very good. The atmosphere/service was: The express menu costs £16.95 for two courses and £19.95 for three, but I only wanted the one course from that menu, and I really wanted a side dish of macaroni cheese from the a la carte menu and a dessert from the full dessert menu; the waiter said that would be no problem. However, I think the waiter must have misheard when I ordered the dessert as he brought the wrong one, but apologised and quickly replaced it with what I wanted. I did also notice that the man at the next table ordered a coffee and a full English breakfast; his food came and he pointed out they had forgotten the coffee. So maybe remembering what people have ordered wasn't their strong point on this particular day! Service was fast, which is what you want when you're waiting for a flight, but I also felt I could have lingered at the table and read a newspaper if I didn't want to go and sit at the departure gate. It was a nice, peaceful restaurant, full of business travellers and mainly solo diners with a few small groups, rather than families or young couples. Price range/value for money: Obviously more expensive than other departure lounge restaurants but it is Gordon Ramsay. I think the peaceful atmosphere also makes the extra cost worthwhile. Would I recommend it? Yes, it was an enjoyable meal and a nice way to relax away from the bustle of the departure gate before a flight. I want to go to London now! My husband would never go if I told him the restaurant name though. He hates plane food! Lol!